Patricia is a sophomore at WHBHS. 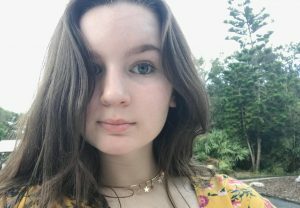 Hailing from East Quogue, she lives with her parents as well as her two younger sisters, who are attending the middle school and high school this year. Writing, painting, and visiting her home in New Smyrna Beach, FL during the summer are her favorite things to do. Traveling is something Patricia loves, and she is looking forward to visiting Hawaii with her friends during spring break this school year. This is her first year writing for The Hurricane Eye.